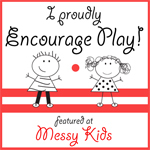 I'm a big believer in messy play. I used to drive my co-teachers crazy with the messy activities I'd set up at preschool; from flour sensory play to painting with shoes there was never a lack of messiness in my classroom. My kids practice messy play at home too. My son enjoys mixing up strange concoctions and my daughter regularly uses her face painting kit to practice her artistic skills on all the kids in the neighborhood. Recently my son enjoyed playing in the sprinklers....err...the mud outside. Last week's It's Playtime was full of creative messy play and art ideas. From painting with hats to playing in a kiddie pool of shaving cream, these kids made a mess....and had a blast doing it! 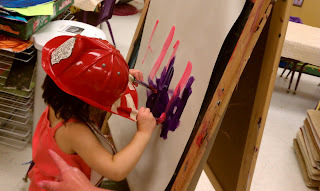 Over at The Play-Based Classroom, these kids tried Painting with Hats. To me, this is what preschool should be all about: experimenting! 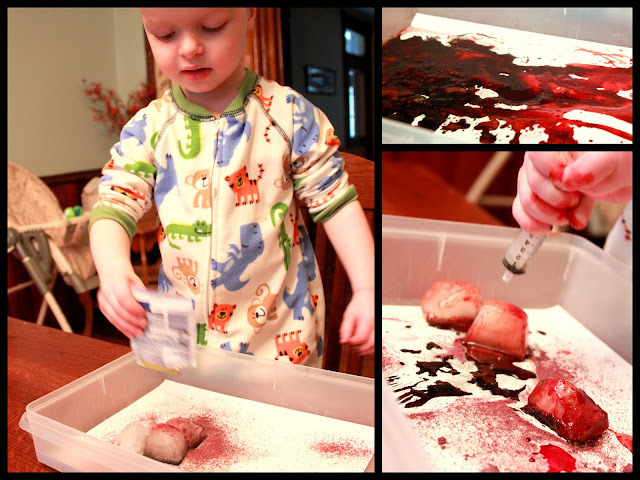 Our very own It's Playtime pal, hands on: as we grow, posted this messy Koolaid Paint activity. Koolaid, ice, and a little boy, what better combination can you think of for messy play? Henry even made a cool and colorful mess during clean-up time! 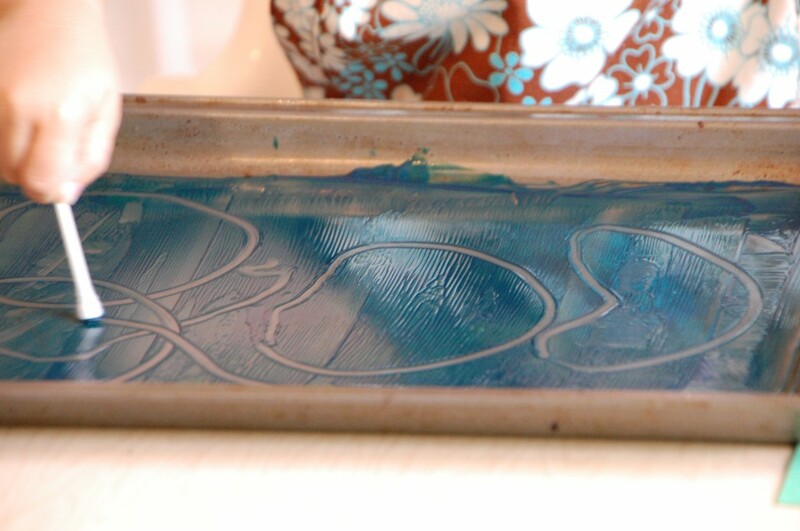 Tinkerlab used cookie sheets to create unique and beautiful Monoprints. And what little one can resist a moment to stick her hands in paint? None that I know! What's more fun then a birthday party? How about a Messy Art Birthday Party! L from Play Create Explore had the messiest 3rd birthday party I've ever seen! And boy, these kids are having a blast! And while you are there, check out another messy art idea they posted last week, Painting on a Dry Erase Board. If you were featured this week, don't forget to grab your special "featured button." Now, on to this weeks play date! * Link up a post about a playful learning experience enjoyed by kids. * Give us love and pop a button into your post/blog. Invite your readers to the weekly play date! 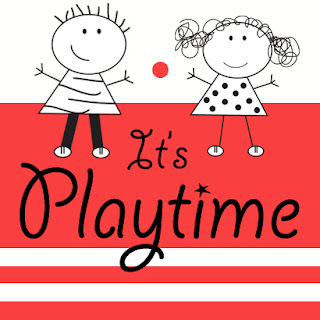 * Stop by one of our blogs every Thursday and add your link about play. Your link will show up on each of the blogs in the It's Playtime community. * Be sure to visit some of the links that catch your eye. Commenting on posts that you find interesting or inspiring is a wonderful way to develop your own playful community. Thanks for the feature! I am totally addicted to It's Playtime! This is a terrific hop! I added your button to the weekly blog hop list on my sidebar. I'm your newest follower, Kate. Looking forward to reading more of your amazing blog! This is a wonderful blog! I hope you will visit mine sometime: Kindergarten for Teachers and Parents. Welcome to my blog Susan. I will certainly check yours out. Hope to see you around more! Thanks for the nice blog. It was very useful for me. Keep sharing such ideas in the future as well. This was actually what I was looking for.